Ahead of the Saturday’s elections, the Campaign Council of the Katsina State All Progressive Congress, APC, has vowed to deliver 2.8 million votes and give a resounding victory to President Muhammadu Buhari and Governor Aminu Bello Masari for their second term bid. APC Atiku’s candidature, a blessing to Nigeria, says Jerry Useni Chairman of the campaign council, Mustapha Muhammad Inuwa, disclosed this while addressing newsmen ahead of the visit of the Presidential campaign train of President Buhari to Katsina State on Thursday. Inuwa, who doubles as Secretary to the State government, said he is confident that the party will win but wants to give the President a resounding victory. He said that in 2015, the APC won with 1.3 million votes but that this time, the party intends to double the votes to 2.8 million. According to him, “About 3.2 million Permanent Voters Card, PVCs have been collected so far in the state. Out of that, we want to give President Buhari 2.8 million votes. “In 2015, it was less than this. About 2.8 million PVCs were collected, vote casted was about 2 million and we delivered 1.3 million votes for President Buhari. We intend to double that this election. “We, in Katsina State are re-assuring President Buhari of our unflinching support as he is determined to take Nigeria to the next level. 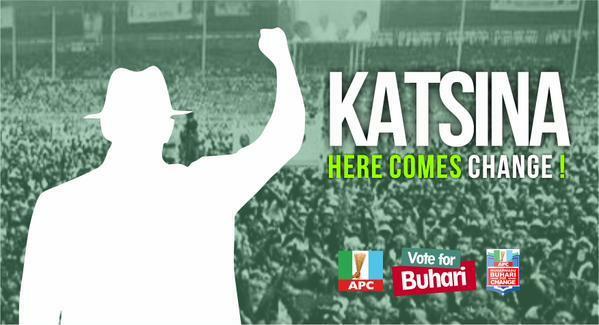 “The campaign will be the grand finale, from here (Katsina) he (President Buhari) will move to his hometown, Daura for the elections. “We urge the people to come out in masse to give Mr. President a rousing welcome been his home state and an APC state,” Inuwa said. On the party’s electioneering campaign carried out in the state, Inuwa lauded the exercise saying it was hitch-free as no incidence of thuggery was recorded. He said the outings was impressive and recorded large turnouts. He also said that the party received quite a number of decampees from the opposition parties, majorly from the Peoples Democratic Party, PDP, saying that no serious minded person is remaining in PDP of Katsina state. Inuwa, however, urged the electorates to troop out en masse to vote President Buhari, Governor Masari and the APC candidates all through for the party to emerge victorious in the upcoming polls.